There is only one set of traffic lights in Sugadaira Kogen so those coming by car should use them as a landmark. 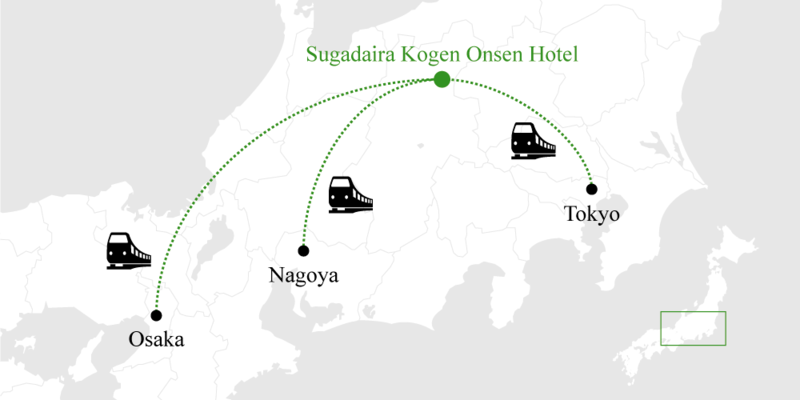 JR PASS is an economical and convenient ticket which enables you to travel around with JR Line, which connect major cities in Japan. Nishi-Sugadaira Bus Stop is the final stop. Your destination is one minute walk from the bus stop. 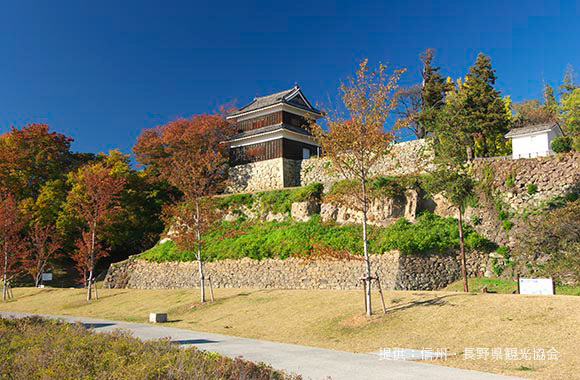 Uedajousekikoen is a park centered on the site of Ueda Castle, the residence of the renowned Sanada Clan and is the focal point of sightseeing in Ueda City. This is a lush and relaxing park enveloped in flowers and green including a path lined with 100 year-old Japanese zelkova trees and around 1,000 sakura (cherry blossom) trees. 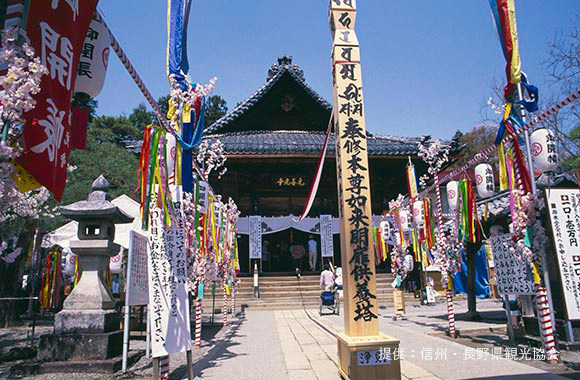 Zenkouji Temple is a non-sectarian temple located in Nagano City. The main building is constructed in the unique 'shumokuzukuri' way of building and is considered a masterpiece of the mid-Edo period Buddhist architecture and the largest scale example in Eastern Japan. With Japan's oldest image of Amitabha Tathagata "three Buddhist images in an united halo" as its principal object of worship, the kanjin and dekaicho of the Zenkouji monks contributed to a standing such that by the end of the Edo period there was a saying that "you should make a pilgrimage to Zenkouji once in your lifetime". To this day a large number of visitors flock here during the Gokaicho held during the years of the ox and the sheep. 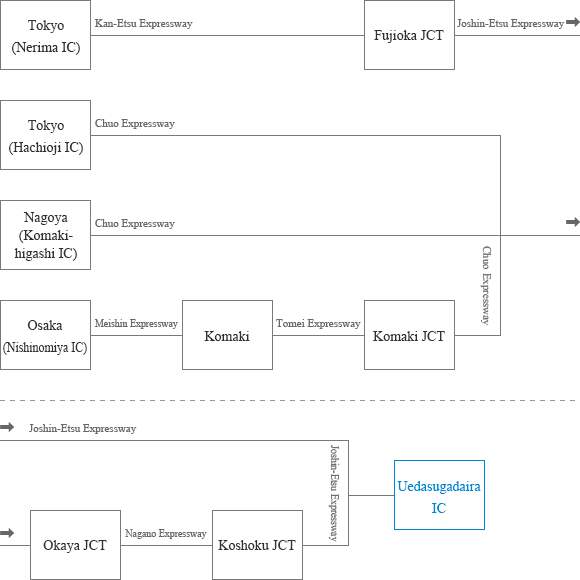 In the Sengoku Period (Warring States Era) Shingen Takeda, known as the Warlord of Kaino, and Kenshin Uesugi from Echigo fought repeated and escalating battles at Kawanakajima in pursuit of control of Kitashinano. 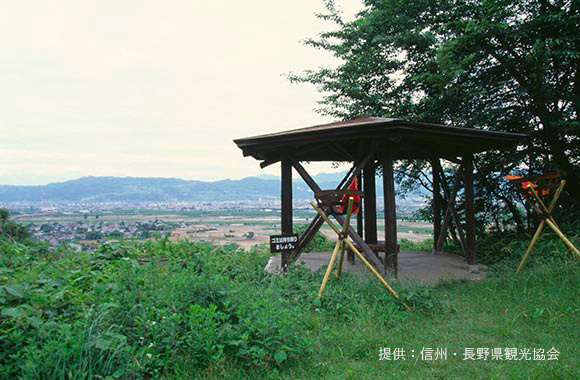 Due to the fact that the fourth and largest battle took place at Kawanakajima (present day Southern Nagano City, Nagano Prefecture), a triangular space of flat land where the Chikumagawa River and Saigawa River meet all this and all other battles are referred to by the general name of the Battles of Kawanakajima. 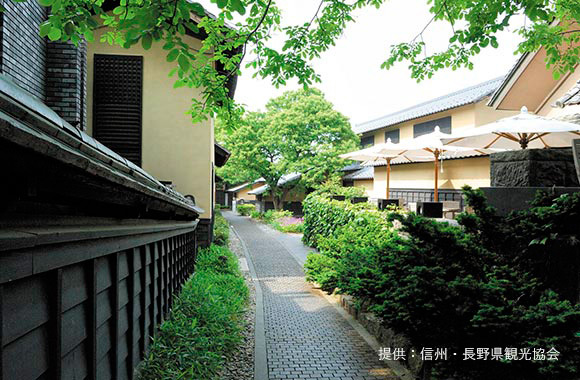 A unique culture bloomed in Obuse, which was visited by many artists and cultured people. Issa Kobayashi and Hokusai Katsushika were among those charmed by Obuse and the numerous works left here in Obuse continue to give pleasure to one and all. Known as the 'village of chestnuts' many old-style confectioners can be found here. This is the site of the residence of the Sanada Clan before the Sanada Clan built Ueda Castle. It is known locally as the 'haunted house' and is also loved for its azaleas. In the site of the residence stands the Koutai Shrine transferred by Masayuki Sanada, with a 80m (eastern side) x 130m (western side x 150m (northern side) x 160m (southern side) earthen clay wall surrounding the site for protection, as well as the 'masugata' rectangular space for troops to meet and remains of the stable. 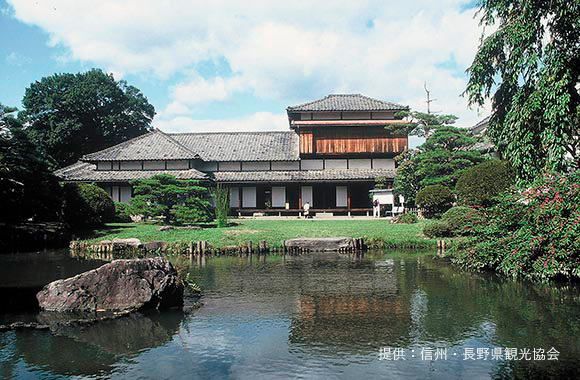 This residence is in the form of a typical residence of a powerful clan in the middle ages but has been preserved in almost complete form that was developed into a precious site by future generations of the Sanada Clan. The surrounds of the site are maintained as a park and are known locally as "the park of the haunted house". A waterfall located in Yonako, Suzaka City which has been selected as one of the top one hundred waterfalls in Japan. The Yonako Falls is the collective name for the Gongen Falls and the Fudo Falls. The Gongen Falls are 75m high and the Fudo Falls are 85m. 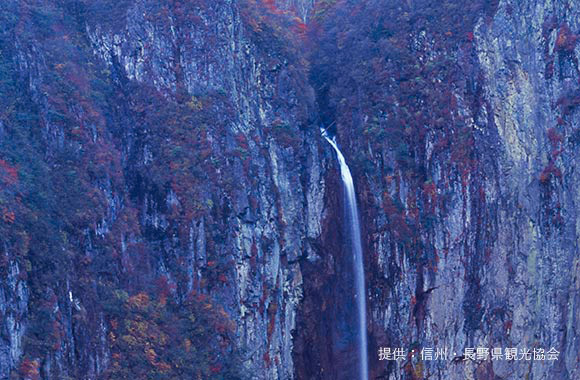 It is extremely rare in Japan for two waterfalls of such height to be formed side by side.